The head of the Roman Catholic church, Pope Francis, turned 80 years old this past Saturday, December 17th. The ever-humble pope broke bread on the morning of his birthday with several homeless individuals before heading to a celebratory mass with his cardinal companions. From that very morning, Pope Francis was receiving thousands of birthday messages via email, as well as calls and letters from world and religious leaders, wishing him a happy birthday. The Emeritus Pope Benedict XVI called Pope Francis to send his own personal wishes, as well as sent him several small tokens as birthday gifts, each with a special meaning for the two of them. The 266th pope, Francis is a native of Buenos Aires, Argentina, and as such he shared Argentinian pastries with the homeless men he was hosting for breakfast in the Vatican hotel, where he has his residence. As a token of their gratitude for being in the presence of the pope himself, and on his birthday no less, the men gifted the pope with sunflowers. 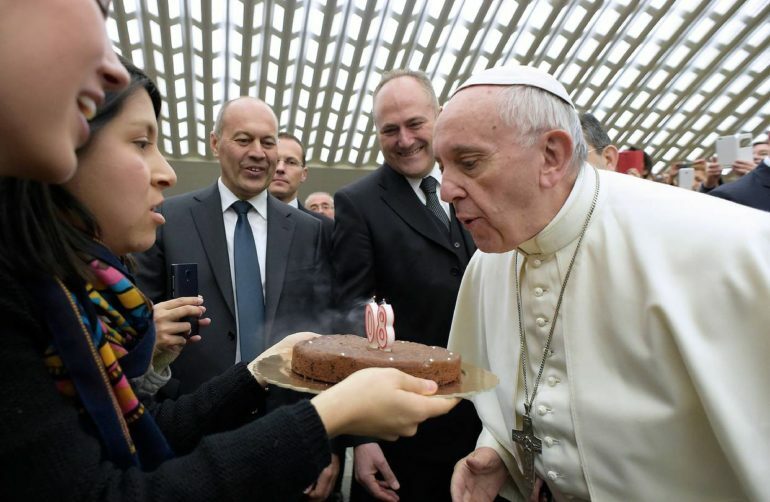 As is customary for this pope, believing in the concept of the gift of return, he sent out 1,500 Argentinian cakes, such as the ones he was eating that very morning, to various homeless shelters around Rome for others to enjoy. When the pope spoke to his cardinals on Saturday morning, he was quoted as saying, “For some days now, I have had in mind a word that seems ugly: Old age, a thought that frightens,” a contradiction of his earlier words from three years ago when he gave an official address, saying, “Old age is the thirst for knowledge … I hope it will be the same for me.” Understandable, as is with human nature, to change one’s mind and perhaps feel the fear that comes with time and aging. Although it was his birthday, the pontiff went on with business as usual. Saturday is just another work day in the Vatican. Pope Francis met with the president of Malta, as well as with the Nomadelfia community, a strictly devout sect that abides by the earlier and harsher rules of Christianity, who sang a beautiful rendition of ‘Happy Birthday’ to the church leader. The pope himself wished on his birthday for a world more endowed with peace and prosperity.